You can begin planting carrots early in the spring, before most other vegetables. Carrots thrive in cool weather and perform best when soil temperatures are around 65 degrees F. Pay attention to the extended weather forecast and try to plant your carrots a day or two after the last expected hard frost in your area. If you want to grow a fall carrot crop, plant them 8-10 weeks before the first expected hard frost in your area. 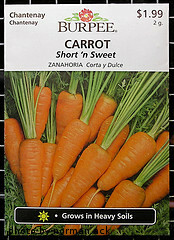 Carrots are planted by sowing seeds directly in the garden. Transplanted seedlings don't do well and have a high failure rate. This is because carrots are a root vegetable and don't like to have their roots disturbed. 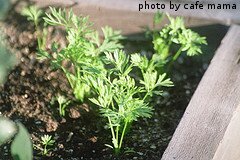 It's almost impossible to remove a carrot seedling from a container and transplant it into your garden without disturbing the roots. Carrot seeds are very tiny. You may surprised to learn that about 2,000 carrot seeds will fit into one teaspoon. Before planting, till the area where you want to grow carrots. How deep you till is dependent on the carrot variety you want to grow. Some carrots only reach 3-4 inches long. In this case, you would want to till 6 inches deep. If you want to grow a more traditional carrot variety that can reach 12-14 inches long, you'll need to till about 16 inches deep. Make sure that the are is free of stones and that the soil is loose and airy. Once your garden is adequately tilled, you can begin planting carrot seeds. Use a hoe and create rows 1/2 inch deep. Space the rows 12-15 inches apart. Scatter the seeds evenly onto the bottom of the row. Try your best to sow 6-12 seeds per inch of row. Don't worry too much about spacing the seeds at this time. After the seeds have been sowed, cover them with 1/4 inch of loose dirt and water them in well. After planting carrots, you'll need to thin them twice. Once the seedlings reach 1 inch tall, thin them out to 1 plant every inch. 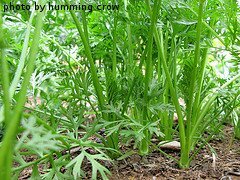 When the seedlings reach 3 inches tall, thin them to 1 plant every 3-4 inches, depending on the carrot variety. Short, fat carrots should be thinned to 4 inches apart, while long, slender carrots should be thinned to 3 inches apart. When thinning, be careful not to disturb the seedlings you want to keep. After thinning, mound some soil around the tops of the remaining plants. This will help prevent the top of the carrots from turning bitter. After mounding the dirt, water your carrot patch in well. The same methods are used to plant carrots in a container. Choose a container that is deep enough for the carrot variety you want to grow. Make sure the container has adequate drainage holes. Use loose and airy top soil or potting soil. If you are using a large, rectangular container, you can still plant your carrots in short rows. You can also use a round container and plant them in one long spiral row. If planting more than one row, make sure the container you choose is large enough to allow at least 12 inches of space between rows. Also, be sure not to plant the carrots too close to the edge of the container as this may cause your carrots to be deformed. Now that you're done planting carrots, it's time to think about watering and fertilizing them.